Get a salon look at home with the Remington Wet 2 Straight hair straightener. This professional straightener works on all hair types including fine, thick and damaged hair. The plates on the straightener have a Teflon and ceramic coating that prevents your hair from burning while creating a shiny finish. The time it takes to straighten your hair depends on how long your hair is, taking take more time to straighten longer hair than shorter hair. Plug the Remington Wet 2 Straight straightener into an electrical outlet and hold down the "On/Off" button until the LCD light turns on. Squeeze excess water from your hair onto a dry towel. Do not rub the hair with the towel as this creates friction and may make straightening difficult. Adjust the temperature dial for the correct heat setting depending on your hair type by pressing either the "+" or "-" buttons. The straightener will automatically turn to setting "15" by default. For very fine, fragile or damaged hair use settings 1 through 4 if your hair is dry or 13 through16 if it's damp. For normal and easy-to-straighten hair, use settings 5 through 8 if your hair is dry or 17 through 20 if it's wet. For thick and difficult to style hair, use settings 9 through 12 if hair is dry or 21 through 25 if it's wet. For wet, coarse hair, use settings 26 through 30. Divide your hair into small sections using a comb. Each section should be small enough that you can wrap your fingers around each section and make a closed fist. The smaller the section, the easier it is to straighten. Clip the hair you are not straightening onto your head. Pull the section of hair to be straightened away from your scalp and hold it taut. Starting at the root of your hair, clamp your hair close with the straightener and pull the straightener down in one smooth stroke. Repeat steps until entire head of hair is straight. Turn off straightener by pressing down on the "On/Off" button and unplug it from the electrical outlet. Let the straightener cool before storing. Set the straightener on the correct temperature for your hair type to avoid damaging your hair. 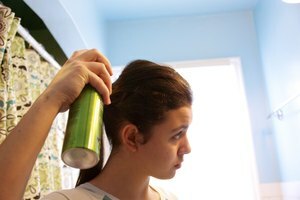 Don't hold the straightener on one area of hair too long as this may damage your hair.